First off, apologies for the lack of good quality pictures. I know that the ones I post up usually are of better quality but we weren't prepared for the lighting situation inside or were really planning on being in picture taking mode. So yeah, I finally went back to Carolina's after all the years since my last visit when I was in high school. I still hear of it being a staple choice in Garden Grove so I wanted to give it another try. Duc and I got an online coupon (I can't remember from which site) to go and made a casual dinner of it. I don't know if it was an off night or what but it was a bit difficult to thoroughly enjoy every plate we had. The inside of set up as expected - a very family style, large-portion Italian restaurant. You would come here for the purpose of eating big portions and sharing it on a casual basis with others. 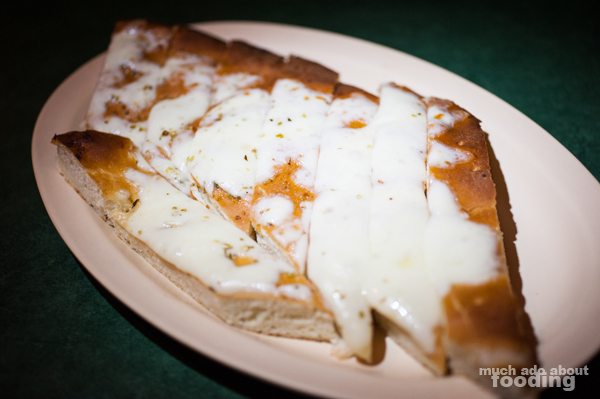 The complimentary cheesy bread that came out was on the dry and barely warm side with a smattering of melted cheese. 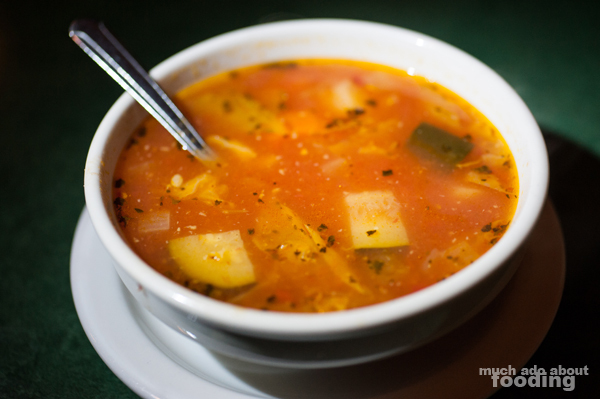 A side of their minestrone soup came Duc's way, and it was more watery and blander than preferred. Props though for the abundance of vegetables. 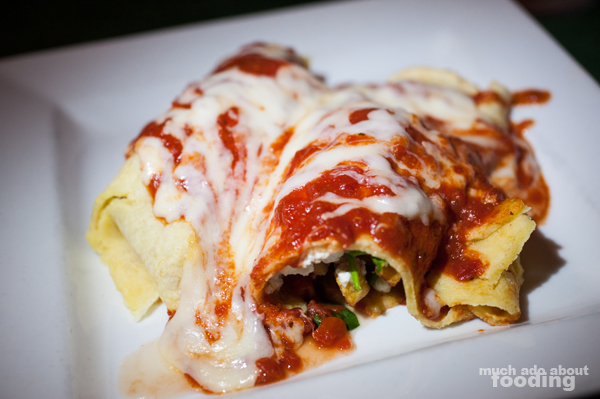 Our orders were for the Chicken Manicotti (thin crepes stuffed with chicken breast, Ricotta & spinach with marinara sauce topped with Mozzarella) and the Angel Hair Chicca (diced tomatoes sauteed in olive oil and garlic with fresh basil on angel hair pasta). I found the crepes to be dry and perhaps it is my fault for not more seriously considering what they had listed; I guess I like my manicotti traditional and as pasta shells instead of as crepes. The chicken breast was a bit dry too. 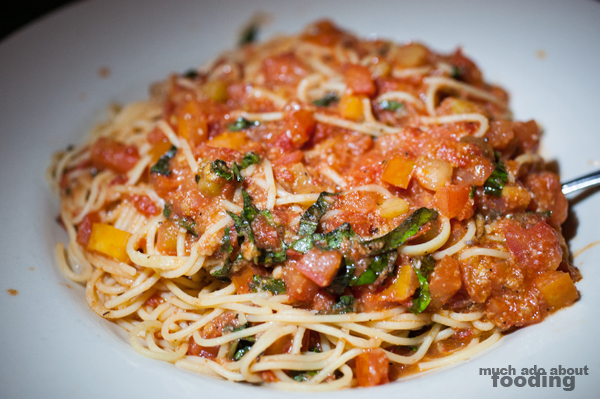 As for the angel hair, I'm always a huge fan of simple angel hair with tomatoes. It's a quick dish that satisfies tomato cravings and pasta-y needs. I'd have to say that Carolina's disappointed on the type of tomatoes used - I found them sour and some on the green side. Unripe? Using the inner diced pieces? It didn't highlight the delicious garlic or fresh basil well, and ultimately that's a shame because those parts of the dish were great. Overall, I just don't think this place fits my style but I can definitely see its appeal to others. The service was great so cheers for good staff! Also, if you're ready for big portions in the GG area, this place gives it and is ready to pack up your leftovers once you finish. My apologies for not giving a more raving review for what others consider a hometown gem!